Weather Alert Map USA for iPhone and iPad is the only app you need for the severe weather information. Get critical severe weather alerts for your location as soon as they are issued. The app provides timely, up-to-the-minute weather information and data using colorful vector-based maps. Stay ahead of severe weather wherever you are with the Weather Alert Map application ! Over the last few months, the weather is one of the hottest topics due to Hurricane Sandy, but lets face it, the weather is always a major focal point with everyday life. There isn’t a day that goes by where someone doesn’t ask me if it’s going to rain or snow. With Alert Map, you will always have that information in your pocket because it shows the latest alerts, weather, radar and even earthquakes. Here are some example images from the weekend and as recent as few hours ago dealing with Hurricane Sandy. 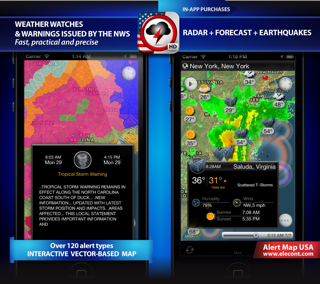 Weather Alert Map offers extensive high-definition radar, 10-day forecast and earthquake data via In-App Purchases. * Advisories, watches, and warnings for: Severe Storms, Tornadoes, Wildfires, Earthquakes, Winter Weather, Extreme Temperatures, Tropical Storms, Hurricanes, Typhoons, Volcanoes, Tsunami, Wind, 911 Outages, Fog, Flooding, Civil Emergencies, Nuclear Power Plant Warnings, Law Enforcement Warnings, Local Emergencies, Child Abduction Emergencies, Avalanches, and more. • Zoom in and find all the local weather stations surrounding your chosen location. Travel the world and find live weather conditions displayed for exotic locations. Switch between your favorite locations. These things help to make travel easy! • Uses data from multiple agencies worldwide, including the U.S. Geological Survey, and the European Mediterranean Seismological Centre.